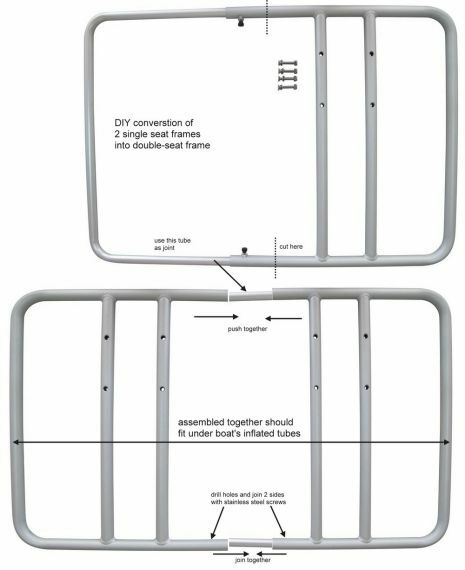 Aluminum seating platform frame for inflatable boats dinghy. A total upgrade from a plywood bench to the comfort of swivel seating with back support. Now you can really enjoy the ride and have control over your boat's engine! Invented by BoatsToGo, patent pending! This adjustable aluminum frame-seating platform takes riding comfort to the next level. 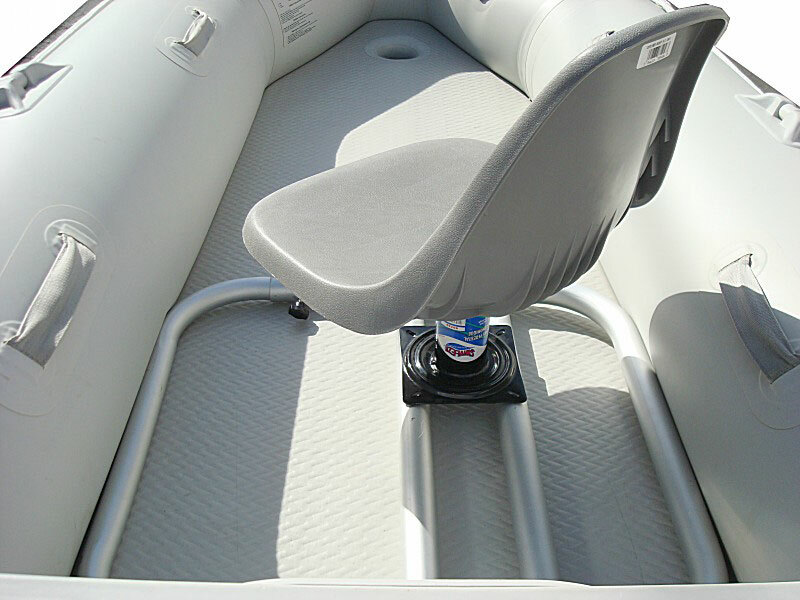 Now you can control your outboard engine, while a padded boat chair supports your back. After trying this new system, you'll never go back to a regular plywood bench. It also can work great with our new central console! 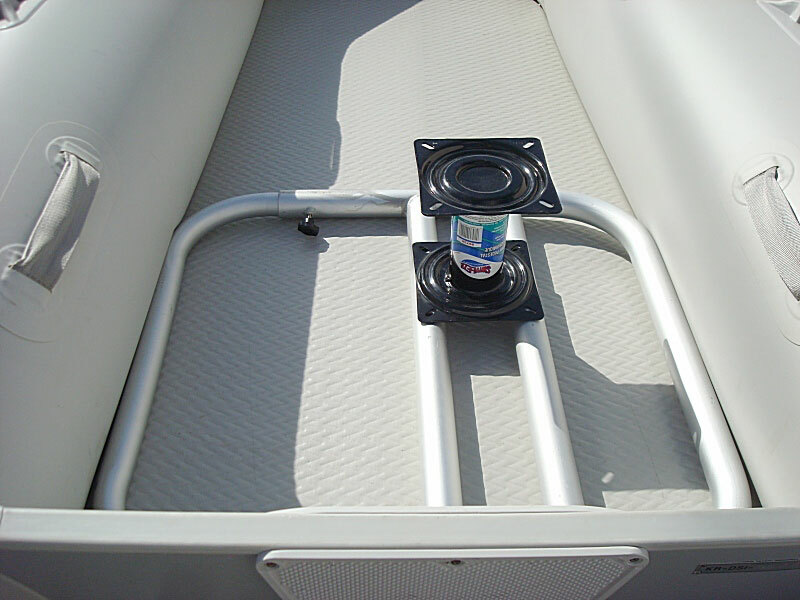 Due to the fact that this system is mounted to the floor and not to the boat tubes, vibration and bumps during a choppy ride are significantly reduced. 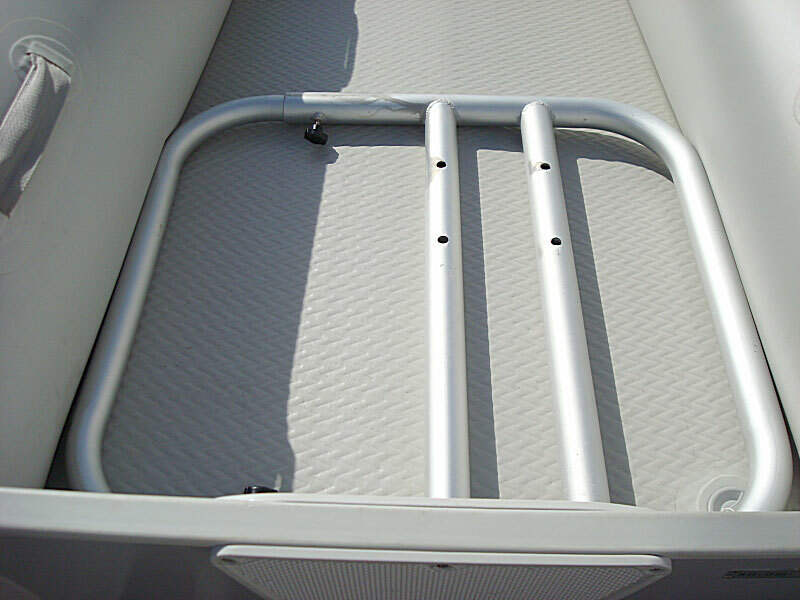 Holes in the aluminum frames are designed to match 7" economy boat seat pedestals that are sold in many retail stores such as Kmart, Wal-Mart and Outdoor World. A swivel base and boat fishing chair with back support can easily be installed on top of the boat seat pedestal. 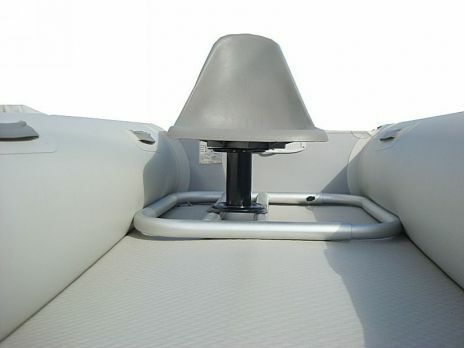 An Economy boat seat pedestal retails for around $12, a swivel base costs $8, and fishing chair prices can vary depending on comfort level from $20 to $45. You also will need stainless steel mounting hardware. Bolts with round heads should be inserted in the frame from the bottom up, so that the round head of the bolt touches, but does not scratch the floor. 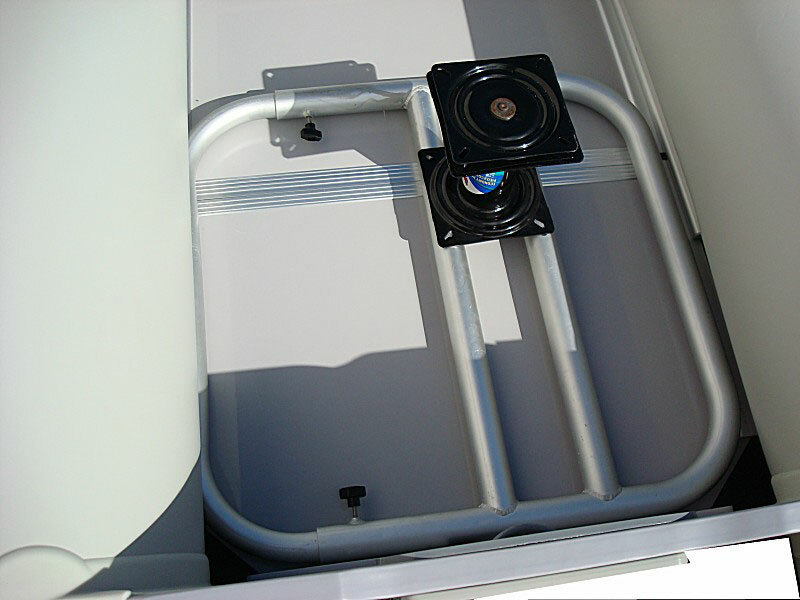 The adjustable aluminum frame can fit any size boat from SD230 to SD600 and many other brands of boats on the market. It will work with air deck or hard deck boats. Seating Frame Installation on air deck boat models. Click to zoom in. Seating Frame Installation on plywood deck boat models. The installation is simple. First, deflate the tubes and simply place the platform inside the boat. 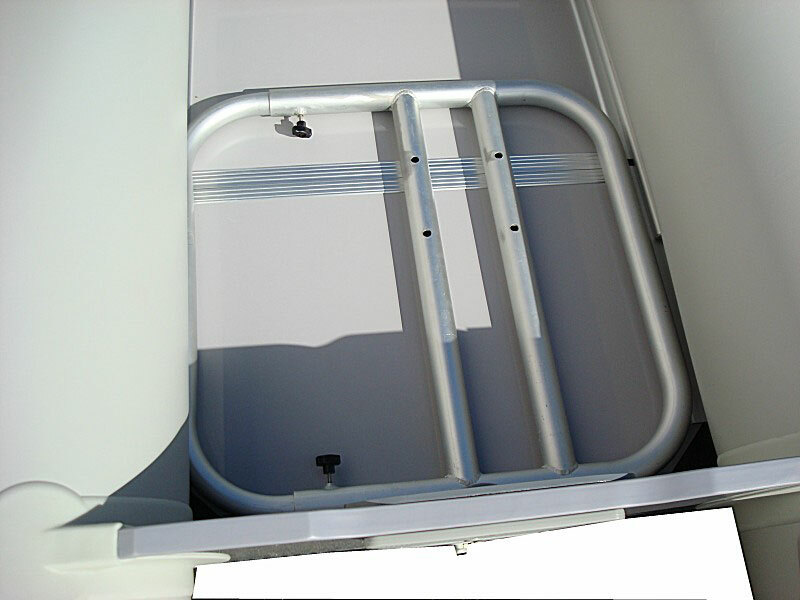 Then, push the adjustable components away from each other until the outer sides of the aluminum frame tubes touch the inside of the boat tubes. Finally, tighten the screws and inflate boat tubes to squeeze the seating platform between the boat tubes. For boats with plywood floors, the platform will rest on the stringers. 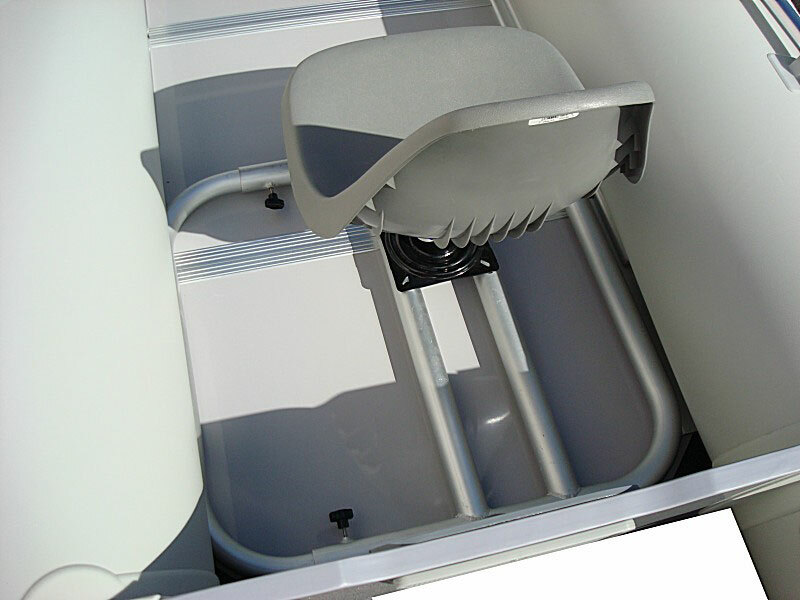 PLEASE NOTE: Boat chair pedestal, swivel platform, chair and hardware are not included, but can be purchased separately at many retail stores. Four bolts provided as free bonus gift, so that to secured pedestal to platform. 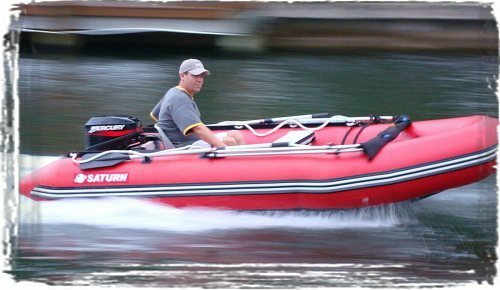 Sitting frame will extend from 29" to 44", fitting most inflatable boats with interior widths between those measurements. Will fit all Saturn and Azzurro Mare models 8.6' length and up. Will not fit into KaBoats. Frame width is 29". Single platform can be converted into central console by welding L-shaped handle to support steering system. That can be done at any local welding shop. See drawing with dimensions for more information. 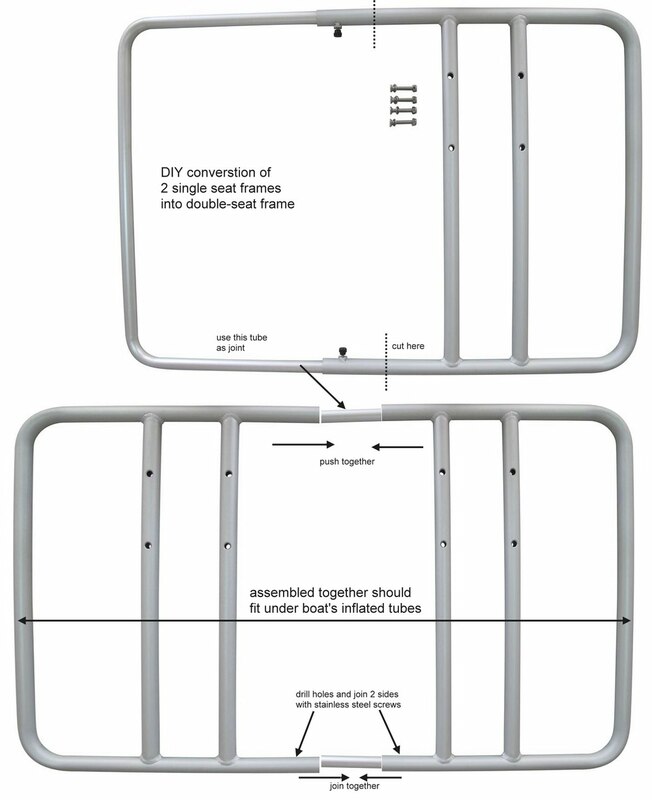 You may need to cut out C-frame shorter to make it easier to fit inside main frame for narrower type of boats. When inserting or removing C-frame into or from main frame, try to hold both hands at both insertion points at the same time, and then move C-frame inside or outside at equal distances/steps in order to avoid C-frame getting stuck under the angle inside main frame. If it happen, step on C-frame, spray with WD40 and pull main frame slowly, or use rubber mallet. You just need to assemble frame at proper distance once, and then lock it with thumb screws. Then you simply deflate one tube, push frame with attached seat inside, on top of the floor, and then re-inflate tube to keep frame in place. To remove frame from boat, simply deflate one side of tube and pull frame out.